The Alcott Lunch Club meets from 11:30 a.m. to 12:30 p.m. Children are asked to bring a healthy, PEANUT-FREE lunch provided from home. A nearby refrigerator is available for parents to store their child's sack lunch. The Alcott Lunch Club classrooms are equipped with age- and size-appropriate bathroom facilities, materials, and furniture. This empowers the children to be independent, feel safe and secure, and open their minds while enjoying this experience. The Alcott Lunch Club will gather together daily as a group. 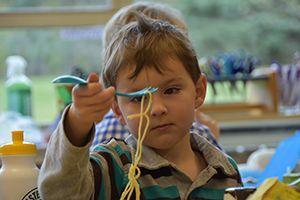 The instructors of this program, Ms. Sue Buhrmester, 1ST STEP Curriculum Instructor, and Ms. Jen Baurer, Preschool teacher, will provide a prepared environment with classroom elements that appeal to the authentic interests of the children. Immediately following the community lesson, the children will have lunch and enjoy a visit to the playground until 12:30 p.m., weather permitting. The Alcott Club does provide extended hours to 3:15 p.m. for any preschool or junior kindergarten children that desire an afternoon program. Those children remaining in Alcott Club will return to our classroom following the outside playground play period to prepare for rest time. As the children wake from rest time, a number of thematic activities (circle time, music and movement, art, science, language arts, and math) will begin. At the conclusion of the designated activities, the children will gather for a snack to conclue their day.